Can your smartphone or tablet stop a bullet? No, it is unlikely that it would ever have to. However that is a very real possibility for the mobile devices carried by today’s increasingly digital warrior. Hopefully, even on the battlefield chances are that a computer will not take a round, but they are exposed to extremes of wind, rain, dust, temperature and vibration that no commercial device has to face. That means they need to be built to take it, and that is exactly what manufacturers of ruggedised equipment such as Trimble do. All Trimble computers, handhelds or tablets, are designed to be rugged from the inside out – even their chipsets are rugged. 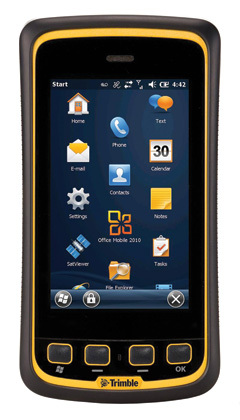 Unlike a consumer device such as a smartphone or tablet with an outside shell that might protect against a few drops to the ground or a spray of water, Trimble handheld computers are tested to the latest military standards to keep working through high heat, humidity, salt water, dust, vibration, shock and other extremes. They are able to handle multiple drops, hard rain or water immersion and keep working in the field. They also have long battery lives and optional external batteries that can be changed out in the field so there is no need to worry about crucial communication devices going dead when they are needed most. 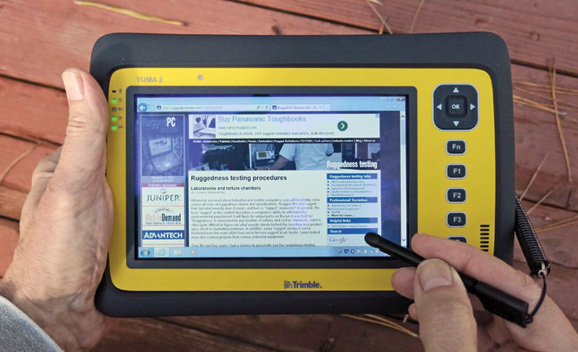 The Yuma 2, one of Trimble’s offerings is a fully ruggedised tablet that also contains a unique display technology that allows full readability even in direct sunlight. Many competitors claim sunlight readability but in glaring sun the screen will darken. Not so with the Yuma 2. Even in the desert, or in the jungle, if the sun is shining directly over the shoulder of the operator, he or she will still be able to access orders, view maps, collect ISR data, even take and see photographs and video. The Yuma 2 also comes with an option for enhanced GPS for 1-2 meter accuracy. The Juno T41 is a smaller handheld that is just as tough as the Yuma 2, and provides options for omni-directional, rapid-scan barcode reader; UHF RFID configured for fast and accurate reads anywhere in the world, and enhanced GPS. For the military, the Juno T41 has a configuration that will allow radio transmissions to be disabled, so soldiers in sensitive areas are not compromised. Another Trimble handheld computer with a highly loyal military following is the Nomad, which is prized for its longevity and for a dedicated software product designed specifically to be used with the Nomad for sniper calculations. Now in case you are thinking that all that ruggedisation and extended battery life means the devices are much heavier, think again. Any company that designs tech for the military is aware of issues of SWaP, size, weight and power, and Trimble is no exception. Long life battery and light-weight computers that can be easily carried are part of the standard Trimble requirements when building mobile field equipment. They are all designed to be strong, but add as little as possible to the soldiers existing burden or power requirements. Trimble products are being used by all branches of the United States military and by NATO countries. Besides the handhelds from Trimble MCS, products such as survey equipment systems, unmanned vehicles, robotics and many rugged equipment components are part of Trimble’s contribution.